1. Install the bearing assemblies and spacer on shaft with a press. The distance (X) must be 1.17 in. (29.7 mm) after assembly. 2. Install seal in bearing housing with lip of seal toward bearings with tooling (A). 3. Put the shaft and bearing assemblies in position in the housing and install ring (10). 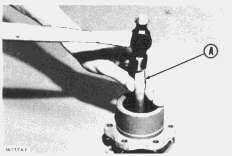 a) Put water on the ceramic ring, rubber cup and bore of pump body with water. 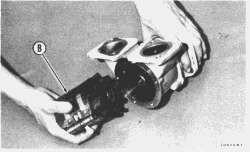 b) Install the rubber cup in pump body. c) Install ceramic ring (hand pressure only) inside of rubber cup with shiny side toward the impeller end of the body. 5. Install wear plate (4) in body. 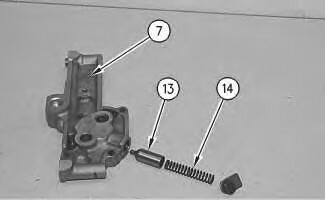 Put cam (1) in position in body and install screw (2). 6. Install slinger (9) on shaft and put the pump body in position on the bearing housing. Install bolts that hold bearing housing to pump body. a) Put water on the inside of seal assembly and on shaft of pump. b) Push the seal assembly and spring on shaft (hand pressure only) until shiny face of carbon seal makes contact with the shiny face of the ceramic ring (7). The tangs of spring (5) must be in alignment with notches in case (6) of seal assembly. 8. Install the O-ring seal (3) on shaft. 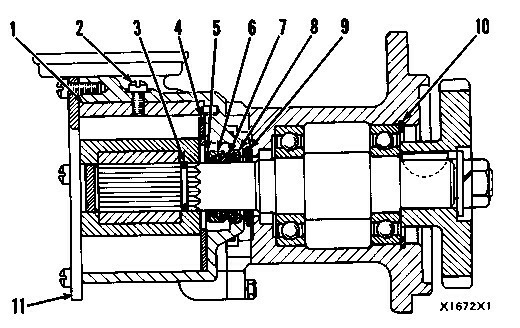 Install impeller in pump body with tool (B). Install end cover (11). 9. Install the key. Put the drive gear in position on the shaft and install the nut and washer. 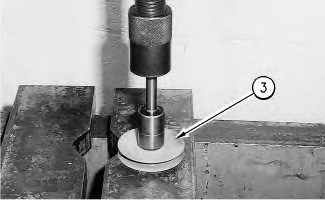 Tighten the nut to a torque of 50 ± 5 lb.ft. (6.9 ± 0.7 mkg).